LaViolette reasoned that given that this ice age super SPE was large enough to substantially disturb and possibly even temporarily collapse the geomagnetic field, large amounts of extraterrestrial dust residing in the circumterrestrial dust sheath would likely have been jettisoned into the stratosphere. This could account for the sporadic reports of an extraterrestrial debris-rich layer said to overlie the remains of extinct megafauna in early YD sediments and could also explain the discovery of a nanodiamond-rich layer found in Greenland ice correlating with the time of this event. However, the amount of this deposited material would likely have varied considerably from one place to another which could explain why these indicators are not always found. This ET debris layer was initially cited by a group of scientists led by Berkeley scientist Richard Firestone as evidence that the Pleistocene mammals were wiped out by an impacting comet. But among the most serious objections to the comet theory is the absence of the nitrate ion signature which should have been present in the ice record if an impact and ensuing fireball had occurred at that time. If present, it should have been quite obvious since it would have been 105 times higher than the highest levels seen in the ice age portion of the Greenland ice record. Also many paleontologists believe that the mass extinction did not occur all at once in a solitary extinction event, as the comet impact theory had proposed, but rather transpired over a few thousand years. The solar proton event hypothesis allows for a more progressive extinction episode by allowing the occurrence of multiple extinction level episodes. The early YD events, though, being among the most severe, would have precipitated the final phase of this demise. LaViolette is doubtful that a super SPE of such a large magnitude is likely to occur in the near future. He points out that the reason why it occurred at the end of the ice age is because the Sun for several millennia had at that time been in a highly active flaring state, behaving similar to a T Tauri flare star. He attributes this elevated solar activity to the presence in the solar system of high concentrations of interstellar dust which at that time were being driven inward by a wind of galactic cosmic rays. Background information about this dust incursion theory may be found in his Ph.D. thesis, his book Earth Under Fire, and in various papers he has published. One question that arises is how would paleolithic man have survived this event. 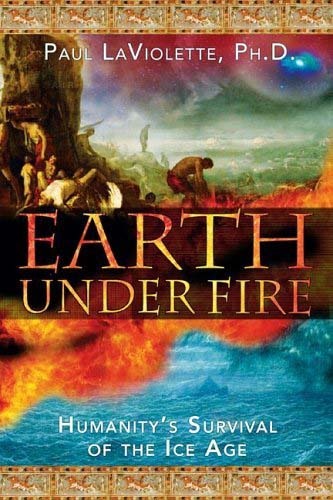 LaViolette’s book Earth Under Fire, which he first published in 1997 and later updated in 2005, relates stories and ancient legends from around the world describing how the Earth had once been burned by the Sun, an event that was said to have brought about a world conflagration and even caused genetic mutations in animals. Some legends describe how survivors took shelter for several days in a cave or underground dwelling. LaViolette believes that there may be much truth to these stories and that evidence found in the geologic record may cause us to regard them in a whole new light. Paleontologists note that Clovis paleoIndian campsites in North America suddenly terminate at one point and LaViolette notes that this Clovis end date either immediately preceded or coincided with the date of the 12,837 years BP super SPE. Although a new paleoIndian civilization resurfaced some centuries later, these new findings raise the question as to whether this super SPE may have been the cause of the disappearance of the Clovis civilization.